To help expand your experience with The Crew beyond what’s included in the game itself, Ubisoft has announced a Season Pass for PlayStation 4, Xbox One, and PC, priced at $24.99/£19.99 (individual packs will cost $6.99/£5.49). First off, every Season Pass holder will receive two exclusive cars when the game launches on December 2: the McLaren 12C and the Ferrari 458 Speciale. Past that, the Season Pass includes four full-featured add-on car packs, totaling 12 additional cars; 23 additional tuning kits unlocked to spec out the Season Pass car lineup for premium performance on any terrain; all official paintjobs and rims for each car; and an exclusive sticker with each pack. In related news, The Crew closed beta starts today and ends on November 10 for the PlayStation 4 and Xbox One. Need a code? We have plenty! 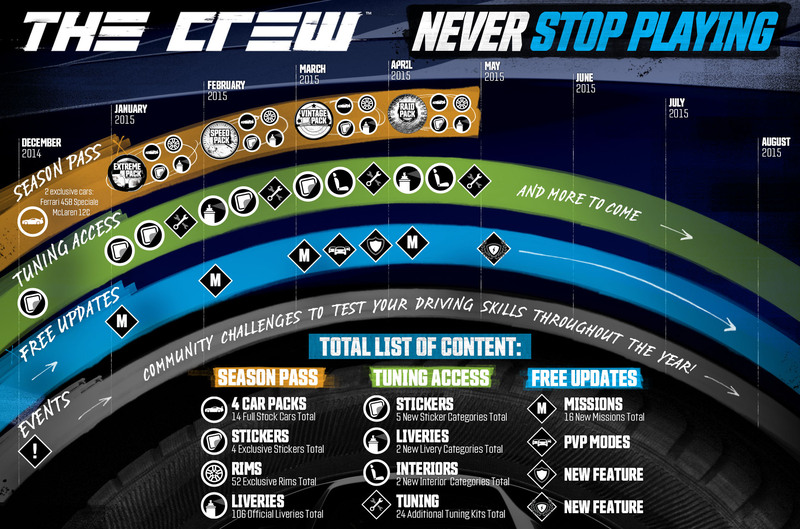 How do you think The Crew post-launch content compares to that of DriveClub?